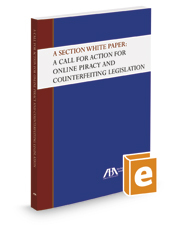 Published by the American Bar Association (ABA), A Section White Paper: A Call for Action for Online Piracy and Counterfeiting Legislation seeks to address the limited category of foreign-originated websites engaged in large-scale piracy of U.S. copyrighted content or counterfeiting of U.S. trademarks. In this case, U.S. copyrighted content is defined as any work or sound recording created in the U.S., covered by federal or state law, capable of dissemination through electronic means, and counterfeiting of U.S. trademarks is defined as the intentional use of a spurious trademark that is identical to, or substantially indistinguishable from, an authentic trademark, in connection with products that are not authorized by the trademark owner or its agent. While the conduct itself may be identical to that prohibited under existing law, these specific actions are not readily subject to adjudication in the U.S. because the website is either beyond the jurisdiction of U.S. enforcement authorities entirely or, even if technically subject to such jurisdiction, is beyond the reach of such authorities to effectively enforce a judgment against it. This limited scope of illegal conduct is the focus of A Call for Action for Online Piracy and Counterfeiting Legislation.